Buyers Right to Cancel: You the buyer may cancel this transaction at any time prior to midnight of the (3) Third business day after the date of this transaction. Under the California Mechanics Lien Law any contractor, subcontractor, laborer, supplier or other person or entity that helps to improve your property, but is not paid for his/her work or supplies, has a right to place a lien on your home, land or property where the work was performed and to sue you in court to obtain payment. This means that after a court hearing, your home, land, and property could be sold by a court officer and the proceeds of the sale used to satisfy what you owe. This can happen even if you have paid your contractor in full if the Contractor’s subcontractors, laborers or suppliers remain unpaid. To preserve their right to file a claim or lien against your property, certain claimants such as subcontractors or material suppliers are each required providing you with a document called a “Preliminary Notice.” Contractors and laborers who contract with owners directly do not have to provide such notice since you are aware of their existence as an owner. A preliminary notice is not a lien against your property. Its purpose is to notify you of persons or entities that may have a right to file a lien against your property if they are not paid. In order to perfect their lien rights, a Contractor, subcontractor, supplier, or laborer must file a mechanics’ lien with the county recorder, which then becomes a recorded lien against your property. Generally, the maximum time allowed for filing a mechanics’ lien against your property is 90 days after substantial completion of your project. (1) Require that your contractor supply you with a payment and performance bond (not a license bond), which provides that the bonding company will either complete the project or pay damages up to the amount of the bond. This payment and performance bond as well as a copy of the construction contract should be fled with the county recorder for your further protection. The payment and performance bond will usually cost from 1 to 5 percent of the contract amount depending on the Contractor’s bonding ability. (2) Require that payments be made directly to subcontractors and material suppliers through a joint control. Funding services may be available, for a fee, in your area, which will establish voucher or other means of payment to your Contractor. These services may also provide you with lien waivers and other forms of protection. Any joint control agreement should include the addendum approved by the registrar. (3) Issue joint checks for payment, made out to both your contractor and subcontractors or material suppliers involved in the project. The joint checks should be made payable to the persons or entities which send preliminary notices to you. Those persons or entities have indicated that they may have lien rights on your property; therefore you need to protect yourself. This will help to insure that all persons due payment are actually paid. (4) After making payment on any completed phase of the project, and before making any further payments, require your contractor to provide you with unconditional “Waiver and Release” forms signed by each material supplier, subcontractor and laborer involved in that portion of the work for which payment was made. The statutory lien releases are set forth in exact language in section 3262 of the Civil Code. On projects involving improvements to a single-family residence or a duplex owned by individuals, the persons signing these releases lose the right to file a claim against your property. In other types of construction this protection may still be important, but may not be as complete. To protect yourself under this option, you must be certain that all material suppliers, subcontractors, and laborers have signed the “Waiver and Release” form. STATE LAW REQUIRES ANYONE WHO CONTRACTS TO DO CONSTRUCTION WORK TO BE LICENSED BY THE CONTRACTORS’ STATE LICENSE BOARD IN THE LICENSE CATEGORY IN WHICH THE CONTRACTOR IS GOING TO BE WORKING—IF THE TOTAL PRICE OF THE JOB IS $500 OR MORE (INCLUDING LABOR AND MATERIALS). LAWS DESIGNED TO PROTECT THE PUBLIC REGULATE LICENSED CONTRACTORS. IF YOU CONTRACT WITH SOMEONE WHO DOES NOT HAVE A LICENSE, THE CONTRACTORS’ STATE LICENSE BOARD MAY BE UNABLE TO ASSIST YOU WITH A COMPLAINT. YOUR ONLY REMEDY AGAINST AN UNLICENSED CONTRACTOR MAY BE IN CIVIL COURT, AND YOU MAY BE LIABLE FOR DAMAGES ARISING OUT OF ANY INJURIES TO THE CONTRACTOR OR HIS OR HER EMPLOYEES. YOU MAY CONTACT THE CONTRACTORS’ STATE LICENSE BOARD TO FIND OUT IF THIS CONTRACTOR HAS A VALID LICENSE. 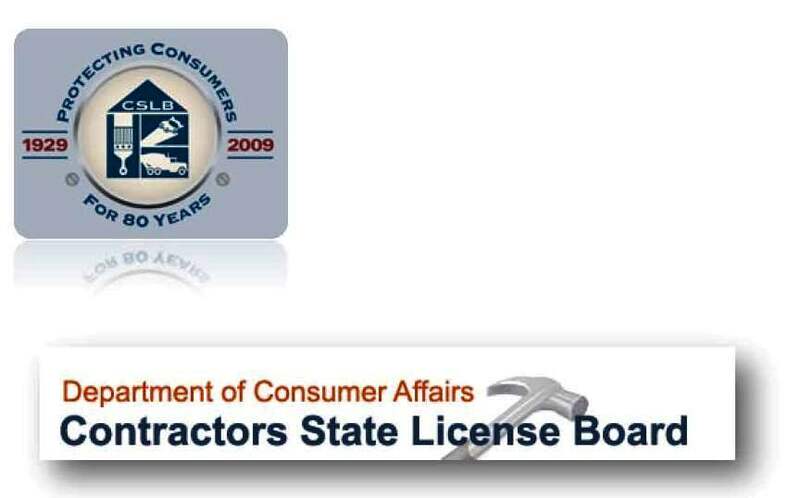 THE BOARD HAS COMPLETE INFORMATION ON THE HISTORY OF LICENSED CONTRACTORS, INCLUDING ANY POSSIBLE SUSPENSIONS, REVOCATIONS, JUDGMENTS, AND CITATIONS. THE BOARD HAS OFFICES THROUGHOUT CALIFORNIA. PLEASE CHECK THE GOVERNMENT PAGES OF THE WHITE PAGES FOR THE OFFICE NEAREST YOU OR CALL 1-800-321-CSLB FOR MORE INFORMATION.